Challenge Artist: How do I edit, hide, or mark my Challenge Entry as sold? You must first sign in to be able to edit your challenge entry. If you have submitted to a challenge before signing in was required, then an account has been created for you. on the pencil icon that appears over the bottom left hand corner of the painting to edit your entry. on the red dot to mark your entry as sold. 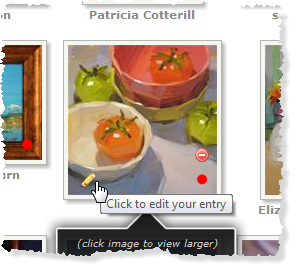 Note: If the painting is already marked as sold, then when you hover, click on the red dot to set as available once again. If the little control icons (pencil, minus, dot) do not appear, then please sign in first. Posted - Tue, Mar 29, 2011 at 9:24 AM. This article has been viewed 5233 times. Get the "I Did the Daily Paintworks Challenge!" Widget. How do I submit to a challenge?